Kicked out?! Yah- I couldn’t believe it either. Isn’t Comic Con FULL of girls in barely there, sci-fi inspired outfits? Anyway, believe me when I say that she came back in style. She customized one of our best-selling bodysuits into a Star Wars Imperial Officer costume by adding gloves, a belt, patches, hat, killer boots and a whip. She also added a sleek leather waist cincher to finish the look. Here are some more pictures of Ms. Curry rocking our bodysuit at Comic Con. We are so proud of her and our Nawty little bodysuit!! Please give us a heads up if you have any other pics or happen to come across any good ones on the ‘nets. We would love to see them. And thank you for being so Nawty, Adrianne! Whistle your way through Comic Con looking sinfully delicious in NawtyFox.com’s Snow White costume. With three different versions to choose from, it’s up to you to decide which is the fairest of them all. Order this week for delivery just in time for the big event. NawtyFox.com is located in Southern Cali and can get your package to you in no time! The above image is taken from the NawtyFox Polyvore Page! Visit NawtyFox.com to get your hands on one. We are located in Southern Cali and can be sure to ship your package in time for the big event next weekend! Wondering What to wear to Comic Con next weekend? Sailor Moon characters are always an outstanding choice and Setsuna- Sailor Pluto– is one of my favorites. Our customers love this costume, which comes with matching gloves and choker. The NawtyFox office is located in Southern Cali, so we’re sure your favorite character’s costume will reach you in time for the big event as long as you order by next week. 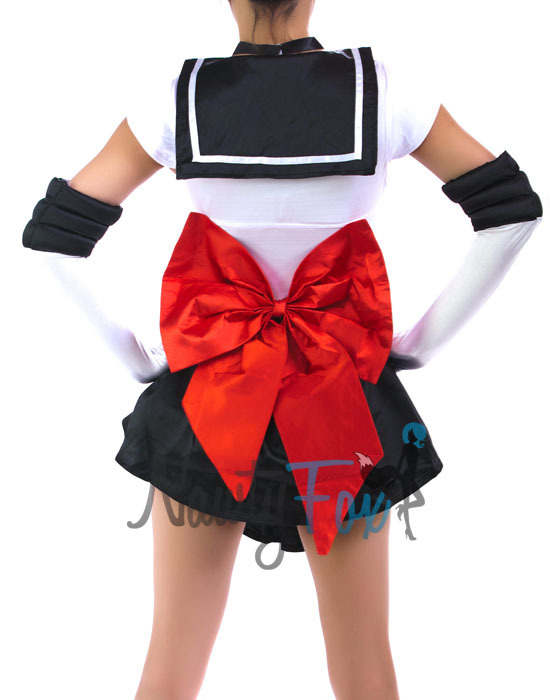 And NawtyFox.com carries Serena, Sailor Mars, Sailor Saturn, Sailor Mercury, Sailor Jupiter, and Sailor Uranus! Choosing just one is tough…! The Sailor Pluto costumes is one of my favorites- she’s such a mystical force on the series. Become the Guardian of Time in this super-cute, high-contrast costume set that comes with matching gloves and choker. I love this version of our Serena Costume because it is so soft and comfortable. It comes with such a cute headband and feels like a dress that I could just wear downtown. I secretly wear it while watching Sailor Moon DVD’s and eating popcorn after work. So what? It’s more fun that way! You have to be a major Sailor Moon fan to work at the NawtyFox office and apparantly I am. Enough about me and more about Comic Con. Are any of our blog-readers going? If so, are you dressing up? What character will you arrive as? Let us know so we can live vicariously through you until we get in on the action ourselves next year!